Fast and professional, this printer is great for commercial label needs: hospitals, pharmacies, retail and large shipping departments. Serial and USB connections allow network applications and direct output from stand-alone devices. Change labels quickly using drop-in supply rolls. Powerful but user-friendly software for PC and Mac lets you incorporate fonts, templates and graphics from your computer onto your label. 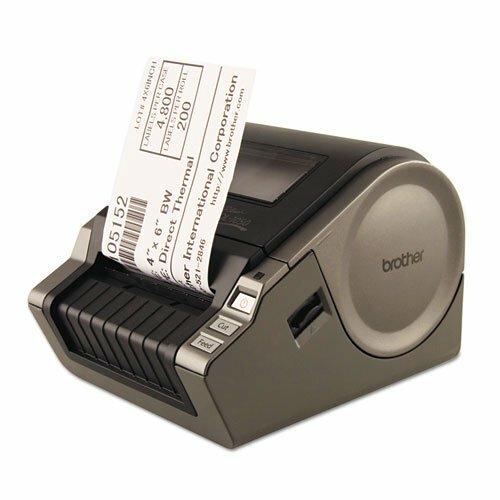 Offers bar code and multi-label printing. PC-generated date/time stamp. Wide format printer has a 4amp;quot; print head. Three internal font styles others are computer dependent. 300 dpi resolution. Dual interfaces, automatic built-in cutter and support for both die cut and continuous length label rolls. Includes USB cable, label-creation software, one starter roll of 4 x 6 shipping labels, one starter roll of 2.4amp;quot; continuous-length paper tape. Maximum Tape/Label Width: 4amp;quot; Printing Speed: 69 Labels/Minute Maximum Resolution Dpi: 300 DPI.